A couple of breaths are enough to reveal the giants beneath the surface. Two Pacific gray whales are spotted just off the coast of Redondo Beach, Calif., two of thousands that are making their way south to warmer waters near Mexico. That’s where many will mate and give birth before returning to Arctic waters. Their journey takes them along the California coast to the delight of tourists, locals and naturalists, such as Alisa Schulman-Janiger. "60 years ago this wouldn’t be happening,” she said. “These are whales that were hunted to the point of extinction." Prized for their bones and oil, Pacific gray whales were hunted relentlessly and were nearly wiped out twice -- once in the mid 1800’s and again in the early 20th century. Alarmed by their exceedingly low numbers and the extinction of the Atlantic gray whale, commercial whaling was banned first by Mexico, then the U.S. in the 1940’s. 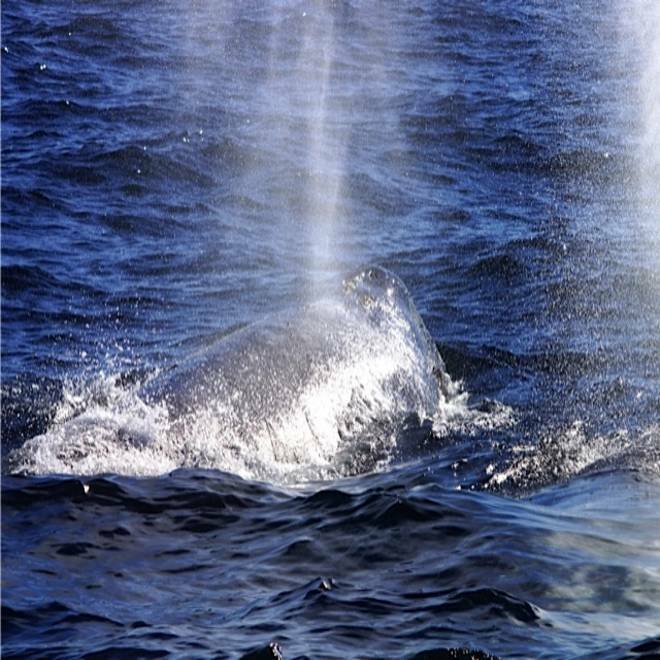 Since then, gray whales have become the comeback kids of the Pacific. 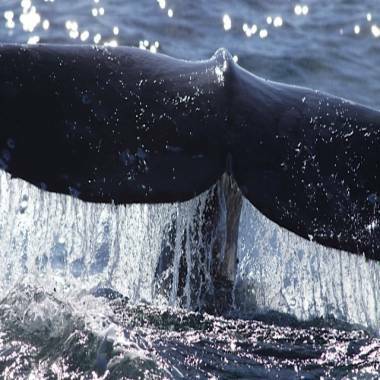 And their success has translated into success for state and national parks situated along the so-called “whale highway.” Cabrillo National Monument even holds a Whale Watching Weekend, an event designed to educate families about the need for conservation. LaShae Bibbins and her husband brought their two daughters to the event. “I really do think it’s important because they can grow up understanding conservation and then maybe being an advocate,” she said. Brennen Nicoletti slowly toured the exhibits with her 2-year-old son perched on her shoulders. American Cetacean Society naturalist Alisa Schulman-Janiger speaks about the importance and preservation of gray whales, stressing that education plays a key role. And then, a shout came up from the boardwalk bordering the coast. Someone had spotted a spout. Visitors quickly pulled out their cameras, standing on tip toe for a better shot. It’s a scene one wouldn’t normally see at this time at Cabrillo, according to Cabrillo spokesperson Emily Floyd. “With our vantage point, it really brings people in. And we definitely do see a rise in visitation in what would normally be an off-season for us,” said Lloyd. With sweeping vistas of the sea, tourists flock to Cabrillo and other coastal parks to see these gentle giants at a time when, on average, attendance is down and state and national parks are struggling. Just south of Cabrillo, San Diego Whale Watch tours is preparing to push off for another tour. The boat is packed, everyone jostling for a good view. The company used to sponsor fishing expeditions but two years ago, owner Christopher Switzer had an idea: “We were driving the boat in from fishing trips and were having to dodge whales,” he said. So the company switched to whale watching and business is booming. 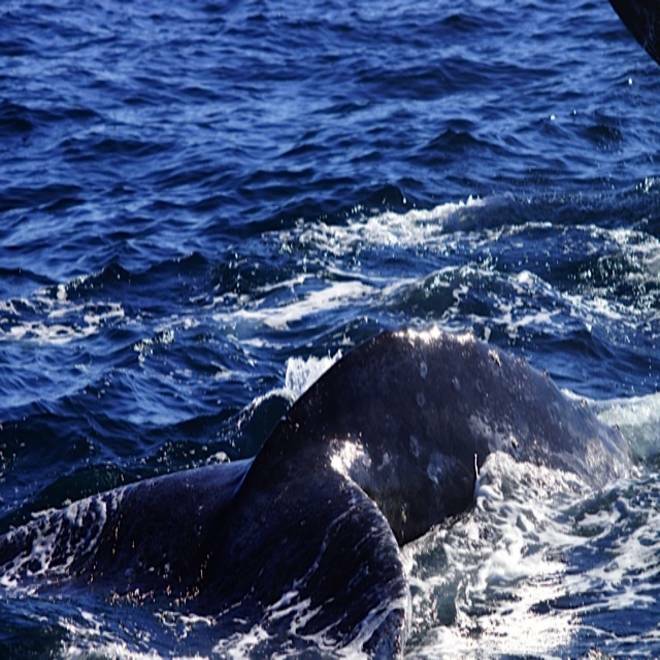 She says the whales aren’t just survivors, they’re proof that successful conservation can lead to economic success. And she’s hoping these rock stars of the sea serve as an example to ensure these and other natural wonders never cease.